Mount Saint Awesome - 15: Megalo-who!? 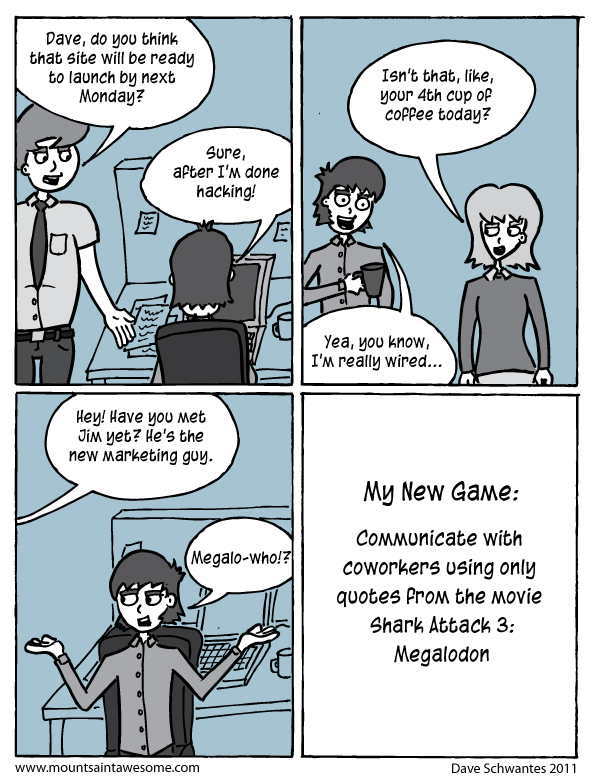 If you're not familiar with the movie Shark Attack 3: Megalodon, shame on you. It is probably the best bad movie about shark attacks ever made! Seriously, there are so many great one liners and cheesy stock footage action scenes in that movie, it's like a perfect storm of sub-par production value genius! This comic is actually a redrawing of a post-it comic I made back when we were doing those. You can see the "original" here. Is it crazy to remake a comic about an obscure bad horror movie? Maybe, but I will also err on the side of giant man-eating sharks!